If you have ever visited a mail center or even the post office, you have probably seen commercial mailboxes installed that offer a high level of security to the people who own the mailbox. The installation of commercial letterboxes is far different than setting up one on the side of your house or on the wooden post at the end of the driveway. Not only must they provide security for each individual box, they must be installed to make certain someone is not going to walk away with the total box. Commercial mailboxes that are placed on poles in the open, are generally bolted to a frame with the post cemented in to the ground. The frame and the box attached to it are anchored by bolts which are different than most others, demanding tools not typically owned by the general public to safeguard them from intrusion. They’ve also been made of much stronger materials than most non commercial mailboxes in the marketplace. Their principal function is to keep your mail safe and from the hands of a mail thief. Most likely, commercial mail boxes are installed through a wall, with the front of the letterbox able to be opened up with an individual key. The letter carrier can access all of the boxes from the backside of the post office box, permitting them to deliver all the mail to the various box owners without needing to open every individual box. Cluster boxes might be another option for outdoor or indoor installation, with a multi-user mailbox secured to a post cemented into the ground. The key focus on commercial letter boxes is on security and the power of the material is one of several principal considerations when trying to find a new box. Nevertheless, the installation must also provide the same level of security. The United States Postal Service is cautious to deliver mail to corporations that lack the safety required by the USPS. Those specifications also pertain to the installment of the mail box and if the United States Postal Service believes it might be removed effortlessly, it very likely will halt mail delivery until corrected. Due to the fact that wall mounted commercial mailboxes should be built into a wall, they are nearly impossible to remove with tools a normal mail thief would carry. Screws and bolts with uniquely designed heads, such as in an “S” shape are generally used for the installation of commercial letter boxes. 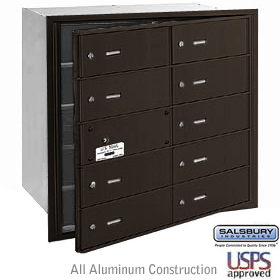 Overall, commercial letter boxes can help to keep mail completely safe from theft.